Today we visited Corkscrew Swamp, a national park with a 2.5 mile boardwalk which is officially known as 'The Best Boardwalk in the World'. Not sure about that but it is OK. We got there about 10.30, and 4 hours later we had only seen 2 herons, a racoon, a couple of woodpeckers, a few anhingas and a trio of alligators. Not much for 2.5 miles me thinks. Don't get me wrong, it is a beautiful place but a bit more wildlife would have been welcome. 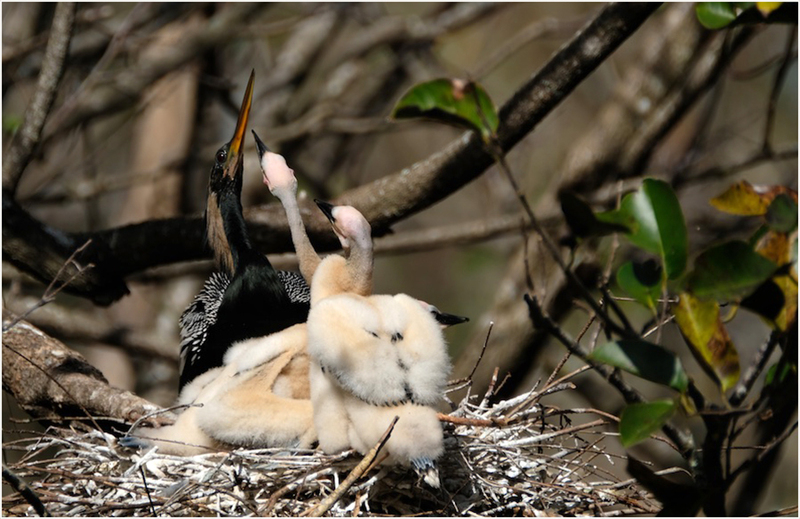 The picture attached is an anhinga nest. The ticket last for two days so we were thinking about going back at 7 am tomorrow. However, when we left we were driving up the road and saw a road with a sign to The Rookery. So we just had to have a look. This is where all the birds are! We will be back tomorrow earlier in the day, although I am a bit concerned about the warnings and posters regarding Beware of the Pythons! We wanted to go to a certain restaurant today. We tried last night but there were huge queues so we gave up. We went today at 4pm! Only just managed to get a table but it was worth coming at this time. The most fabulous crab cakes and tuna. We may go back again. Today I had someone favourite my latest picture on Flickr. I always have a look at the page of anyone who favourites me. There, staring me in the face as the last two pictures on his site were some wonderful pictures of burrowing owls. They were taken in Marco and only 4 days ago! Geoff and I have cruised the streets in Marco. We found lots of sites but no owls. On the off chance I emailed him and asked if there was a remote chance he might let me in on which street they were on. Much to my surprise he has come back to me with the info. Guess where we will be going when we pass back through Marco next week. Beautiful day today, more birding tomorrow.